THE NATIONAL GALLERY OF VICTORIA MARKED ITS 150TH BIRTHDAY IN MAY. IN ADDITION TO THE OCCASION’S DOMINANT NARRATIVE CELEBRATING AUSTRALIA’S OLDEST PUBLIC ART GALLERY, THE NGV ALSO USED ITS MILESTONE TO ENGAGE WITH AND FACILITATE BROADER REMEMBRANCE OF ONE OF VICTORIA’S MOST IMPORTANT ARTISTIC AND HISTORICAL FIGURES—WILLIAM BARAK. THROUGH A SERIES OF COMMISSIONS AT NGV’S IAN POTTER CENTRE, THE LIFE AND LEGACY OF THE WURUNDJERI LEADER HAS BEEN PROMINENTLY RE-PRESENTED AND RE-IMAGINED. Barak’s life (c1824-1903) encompassed a period of intense change and trauma for his people. As a boy he was present at the signing of the 1835 Treaty between members of the Kulin people and John Batman, and as ngurungaeta (clan leader), Barak was a skilled diplomat and politician. He would famously walk from Coranderrk (near Healesville) to Melbourne to negotiate and fight for the rights and living conditions of his people—devastated and immeasurably changed after Batman’s treaty (see Bruce Pascoe, How It Starts, First Australians, Miegunyah Press, Melbourne, 2008). His legacy as an artist is also vitally important; towards the end of his life Barak produced a number of intricate works on paper that documented the traditions of the Wurundjeri people, ensuring that knowledge of this culture would be preserved and continued for future generations. Despite the influence and impressive reputation of this Aboriginal leader, the cultural memory of Barak amongst Melbournians and Victorians remains limited. I first learnt about him at the NGV seeing his paintings on display in the Indigenous Galleries. Three new commissions on display by contemporary artists Vernon Ah Kee, Brook Andrew and Jonathan Jones represent an important opportunity to further ingrain the name and story of Barak into the national consciousness and cultural memory. 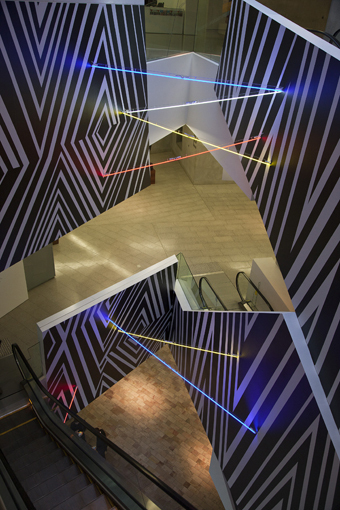 Brook Andrew’s commission Marks and Witness: A Lined Crossing in Tribute to William Barak is a site-specific work installed in the Ian Potter Centre’s atrium. The recurrent Wiradjuri designs and neon stretch up multiple levels, offering an overwhelming and dizzying entrance to a space which is already monumental in its architecture. Like previous works such as Jumping Castle War Memorial (2010), there is an ironic tension in Andrew’s commission. Contrasting the connotations of formality and permanence in the memorialising process with an ironic and playful interpretation, it eschews the representational mode, offering instead an immersive and experiential form of memorial. It also possesses a sense of the ephemeral, a spectacle that may not be on display indefinitely, thus drawing attention to the relative lack of formal and prominent sites of remembrance dedicated to Indigenous histories and heroes. While some historical narratives emphasise the individualistic nature of heroism, Barak’s legacy as leader and artist is fundamentally entwined with the culture of his community. Joy Murphy Wandin, a senior Wurundjeri woman and descendent of Barak, explains the role of the ngurungaeta as those who “take on the responsibility for the entire community” (cited in Pascoe). Thus Barak’s paintings of Wurundjeri ceremonies are not just works by an individual artist, they also reveal the communal practices and celebrations of his people and Jonathan Jones’ commission Untitled (muyan) is inspired by and suggestive of this tradition. 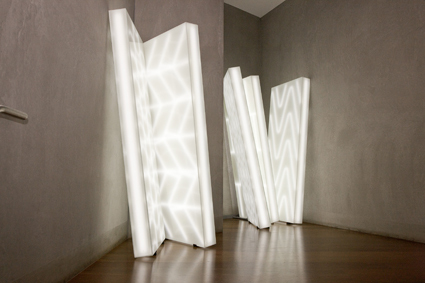 Jones’ piece is composed of five LED illuminated glass light-boxes installed in a large stairwell of the gallery. Arranged into two groupings, it symbolises the two fires seen in Barak’s paintings, one for the Wurundjeri and another for visitors and guests. The white LED lights of the installation will annually turn yellow in August, signifying the blooming of the muyan (wattle), the time of year that Barak had predicted for his own death. Imbuing his piece with this temporality, Jones evokes a subtle sense of ritual and offers a visual cue to viewers, a possible catalyst for further visits and commemoration. When presenting and documenting history, modes of representation and sources of information—history books, museum exhibits, documentary films—are generally positioned through the lens of authority and expertise. Vernon Ah Kee’s work Ideas of Barak is perhaps the most dense of the three commissions in terms of the level of historical information and context provided, however it resists didacticism by acknowledging the complexities and contradictions inherent in historical representation. 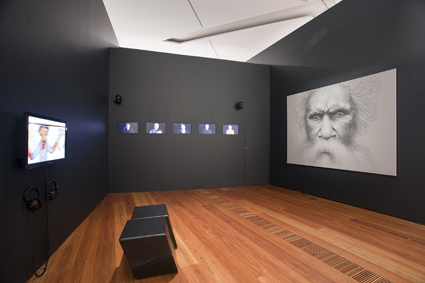 The piece consists of three components: a charcoal portrait of William Barak; a single channel video of the artist exploring and discussing Barak’s life and country; and a five channel video featuring a variety of individuals speaking about their personal ideas of Barak. Rather than offering a singular narrative, Ideas of Barak is constructed around fragments, impressions, imaginings, contradictions, musings, opinions and convergences. Some of the individuals acknowledge not knowing a great deal about Barak’s life—they are neither historians nor experts—yet each makes a personal and present-day connection with this figure. The artwork acknowledges that individuals do not need an encyclopaedic knowledge of history in order to be moved by its narratives and figures, and to play a role in their remembrance. While history might attempt to create linear narratives, memory often encompasses the fragments, fantasies and imaginations of individuals and cultures. Last year, property developers Grocon announced plans to build an apartment building featuring a 32-storey portrait of Barak on its façade (see the plans and an article from The Age), meaning that Melbourne may well find itself with a prominent and permanent public memorial to this Aboriginal hero. However, we must not assume that any single act of remembrance, no matter how visible, marks an end to the memory-work. Cultural memory is an ever shifting and evolving realm, and the NGV’s commissions will hopefully be but one level of an ongoing, multi-layered dialogue that continues to foreground the legacy of William Barak in the consciousness of the Australian public. This article first appeared in the June 28 e-dition.